I've decided to come clean and admit something that I've hidden away for over 15 years. Back in the winter of 1991, I had my very first real emotional reponse while playing a video game. The game of course was Final Fantasy II for the Super Nintendo (later dubbed Final Fantasy IV to harmonize the sequence with the Japanese releases). I remember it well, and while I want to tell you the whole story, I'm afraid doing so would be a major spoiler to uninitiated. Needless to say, Final Fantasy IV is a must-play gaming experience if you enjoy JRPGs. Fortunately, Square Enix is localizing FF IV for the Nintendo DS and should be arriving on North America store shelves on July 22nd. A teaser site containing minimal information has just gone live and can be found here. 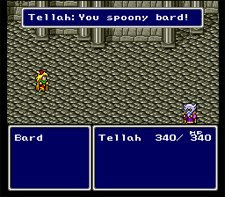 May not be much, but it's enough to make a spoony bard like me more than a little teary-eyed. Oh, and if you're really interested to hear my sobbing FF IV tale, feel free to email me at Paul@nextgenplayer.com.